Asleep at the Wheel: Mastodon's Crack the Skye Cover! 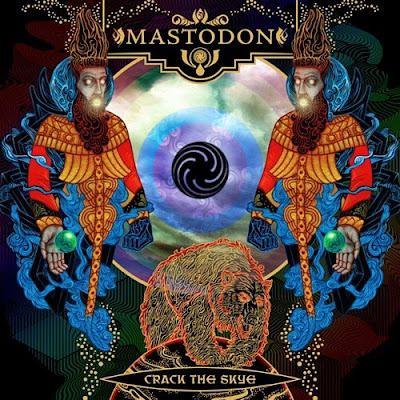 Mastodon's Crack the Skye artwork has been revealed! Keeping a similar feeling to 2006's Blood Mountain, it's epic in everyway! Check out under the pic for a link to a huge 1000x1000 version. Current release date is March 24th with the first single, Divinations apparently coming out on the 27th of Jan in the States...so in just a few hours then. Mastodon are one of my current top three favourite bands and have been since late 2005. CtS has been a long time coming. Blood mountain blew me away and if I had too choose, it would be a contender for my fav album in the 00's so far. Early reviews of CtS have pointed to a much more rock based, prog sound (which was always going to be the case), which just makes my expectations even higher. Expect gushing and/or unapproved man-love for the lads as the album release date gets closer....How sweet would this look on a vinyl? ?